2019 Philo Streaming TV Review — The Channels You Want or Just Fluff? Philo has a restricted channel selection, but it might still have the shows you want—and for an impressively low price. Philo leaves out news and sports channels, and gives you what you really want: just lifestyle options. But is the service still worth it? Philo is kind of an oddball among live TV streaming services. Most companies, like DIRECTV NOW, offer a bunch of different channels and add-ons to try to mimic your cable TV provider so you can cut the cord. And if a bunch of channels and add-ons is what you want, then Philo is not for you. It doesn’t try to give you everything cable would—it focuses on so-called lifestyle networks to give you just a handful of the channels you’d get with cable, but for a much lower price. Philo keeps it simple with two package options and the lowest prices we’ve seen. Philo is dead cheap! It’s the most affordable TV streaming service we’ve seen. Your entire monthly bill will cost about as much as going out to dinner one time. The only differences between Philo’s two packages are the number of channels and the prices. And unlike most TV providers, streaming or otherwise, channel numbers don’t vary depending on where you live. Philo does not play coy—if it says you get 40 channels, then you get exactly 40 channels. One thing we loved about the Philo sign-up process was that it didn’t ask us for a credit card (at least not up front). You just enter your phone number and off you go. You can start binge-watching shows and surfing through channels immediately. Philo will ask for your credit card info after your first two free days. You still get the full seven days free—you just have to pony up your card number before you can finish your trial. 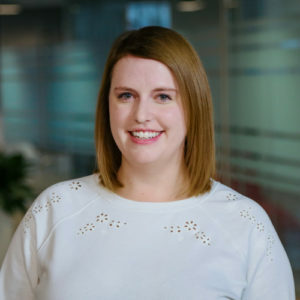 If you’re like us and routinely fall into the free-trial trap of signing up for a service and forgetting to cancel it, then Philo’s softball approach is a good thing. And if you figure out within those first two days that Philo’s service isn’t for you, then you can back out without ever giving up your card number. You can also use your email address as a login. However, if you sign up with your email address instead of a phone number, you have to enter your payment information up front. Even if you decide to keep Philo and pay for it every month, you still use your phone number as your login. Philo texts a code to your phone, which you use as your password, and you’re in. It’s nice not to have to remember one more username and password, but the phone thing can be a bit annoying. 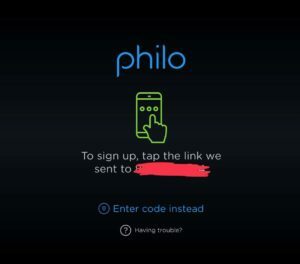 If you have one Philo account for your whole family, but it’s tied to one specific person’s phone number, then it can be a pain to track down the verification code. Philo doesn’t offer many channels, and it leaves out sports and news to focus on “lifestyle” networks. Here’s where we get to Philo’s low-price secret: limited channel selection that doesn’t include news and sports networks. If you’re still holding on to your cable provider because you can’t bear to part with live football and daily CNN, then Philo will not work for you. It doesn’t offer any news or sports channels—not even ESPN. The good news is that if you don’t care about news or sports but you do care about Food Network and HGTV, then Philo might have everything you want. You can watch the Scott brothers build your fantasy dream house here. This is an easy one: Philo does not have any local channels. That’s right, not a single one. You can’t watch ABC, NBC, or FOX with your Philo service. But that’s not a problem if you already have (or are willing to buy) an HD antenna. An HD antenna gives you access to all your local broadcast networks for free. So you can still get your Black-ish fix without relying on Philo. You can also get local news and sports channels, so you won’t totally miss your football fix. Honestly, if Philo has most of the shows you want, but you’re considering a different streaming service solely to get more local channels, then you should just get an HD antenna instead. An antenna doesn’t cost that much, and it’s a one-time expense, whereas with a streaming service you pay for access every single month. Another easy one: Philo doesn’t offer premium channels. You can’t add on HBO or CINEMAX, so if you want either of those services, you’ll have to pay for them separately. In fact, Philo doesn’t offer any add-ons at all. Unlike Sling TV, which gives you endless add-on plans and customization options, Philo limits your choices to its two simple packages and calls it a day. Philo’s DVR is easy to use, and it has unlimited storage for 30 days. Philo has its own version of a cloud DVR, and good news: it has unlimited storage. 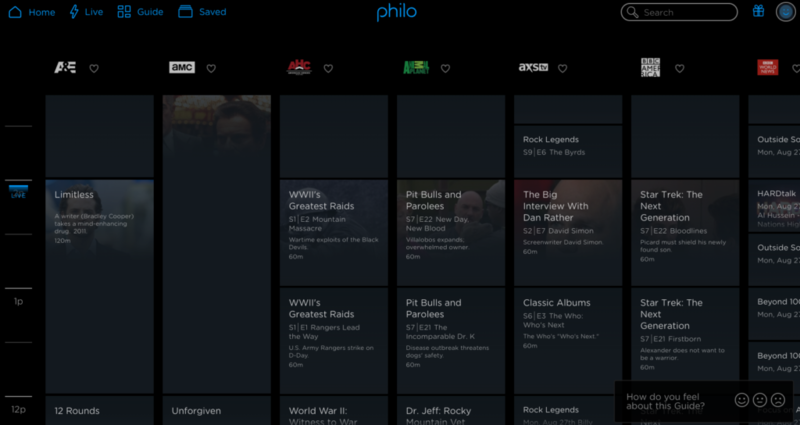 Just press the + button to add a show to your DVR and Philo will start storing episodes for you. You can keep as many as you want, but you do have to watch them within 30 days. Philo’s DVR isn’t as good as YouTube TV’s, which stores your content for nine months. But we still appreciate that Philo lets you save as many hours of content as you want, especially if multiple people use your account and want to record their own shows. On a web browser, Philo has a smooth interface and detailed channel guide. Its TV and mobile interfaces are a little less helpful. We tested Philo on a web browser, a TV (using Apple TV), and a smartphone—and surprisingly, the web browser version had the best interface. Why? Because of its channel guide. Philo was easy to use and ran pretty smoothly on all three devices (minus a glitch on the mobile version), but we wish Philo had the same channel guide on mobile and TV as it does on web browsers. Unlike Hulu with Live TV, which has a million different sections and show categories, Philo has only three: Home, Live, and Saved. Home gives you a mishmash of popular shows, live offerings, and your saved content. If you want to find a specific show or episode, you can use the search function. Otherwise, you can go straight to the saved shows in your DVR or browse live TV. This is where the mobile, browser, and TV interfaces differ: the browser version has a channel guide, while the mobile and TV versions do not. If you think that’s super weird, so do we. Like most people, we like channel guides that clearly show us which shows are on now, which are coming on later, what our channel options are, etc. And Philo’s browser interface does just that. But you don’t get a schedule on mobile or TV. Instead, you get Netflix-style tile images that show you which shows are live now. What played earlier today? What’s coming up next? We don’t know because we don’t have Philo’s guide. The mobile and TV interfaces show you only what’s playing right now. All the Philo content we watched ran smoothly for us. The only issues were a couple of glitches with fast-forwarding. On the mobile version, Pitbulls and Parolees would only let us skip backward, even when we were behind the actual live stream. We could catch up to the live version or backtrack, but when we tried to go forward, we got a lovely black screen. The black-hole screen issue happened only one time. But skipping backward and forward was still a bit glitchy overall. 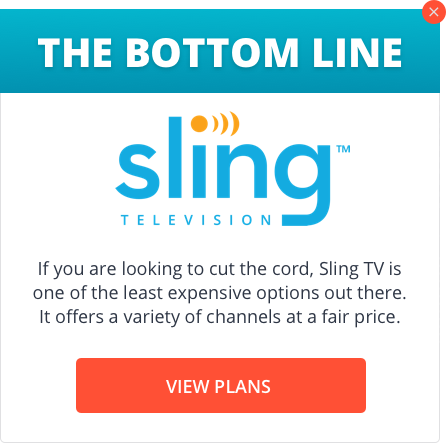 Philo doesn’t work on as many devices as Sling TV. Unfortunately, it covers only a few popular streaming platforms. If you have Amazon Fire TV, a Roku, or an Apple TV, then you’re in luck. But Philo won’t play on your Xbox One. Philo is cheap and easy to use, but look for news and sports channels elsewhere. We like Philo overall, but it’s not for everyone. If you want to watch sports and keep up with the news, then we recommend going with a different streaming provider, like DIRECTV NOW or YouTube TV. Philo also doesn’t offer local channels, so you’ll need to invest in an HD antenna if you still want to watch shows on your local networks. Have you tried Philo TV? Have you had any issues with the mobile or TV app? Let us know in the comments!